Pep Guardiola could be the next England manager - according to reports in Catalonia. Barcelona-based newspaper El Mundo Deportivo claims Guardiola has been tempted by the idea of overhauling England’s approach on and off the pitch. It is claimed that the FA would even seek to take him on in a consulting role if replacing Fabio Capello proves ultimately unattractive. Guardiola is understood to be meeting with club chief Sandro Rossell on Thursday afternoon, with an announcement on his future due first thing Friday morning. Guardiola is expected to manage in England at some point after learning the language and showing a keen admiration for the style of football in the Barclays Premier League. Manchester City and Liverpool have also been linked with him, while Sir Alex Ferguson’s brother Martin, who regularly scouts in Spain, is said to have met the former midfielder with a view to eventually taking over at Manchester United. 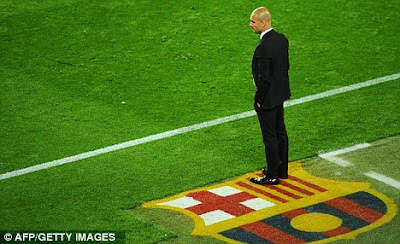 Barcelona hope Guardiola will decide to stay, but have already begun to consider possible successors.